ROME, Jun 15 2018 (IPS) - Even if arrivals of migrants into Italy by sea have decreased between 2017 and 2018 so far, recent events in the Mediterranean rim have strongly drawn attention to the migration issue and a fierce debate is now underway among European countries. On June 10, Italy’s new Interior Minister Matteo Salvini, barred the ship Aquarius, jointly operated by the NGOs‘SOS Mediterranée’ and ‘Doctors Beyond Borders’ (MSF), from docking at Italian ports. There were 629 migrants on the ship. Among them where 123 unaccompanied minors, 11 children and seven pregnant women. The Italian coastguard coordinated the rescue operation but after moving the migrants to the Aquarius, the new Italian government denied access to Italian harbours. Malta, similarly when asked by Italy to accept the boat and take care of the relief, denied responsibility. In recent years Italy has been at the forefront of a constant wave of migration from North Africa and has provided a huge amount of support by allowing the vessels into Italian ports. Malta also, with its relatively small population has accepted a large number of migrants despite its fewer than 450 000 inhabitants and small land size. While public opinion, activists, policymakers, local officials and news agencies have criticised the latest decision by the Italian Government, the Government has also given to understand that it is working towards a solution with other European governments, given the very real humanitarian concerns involved in migration to its shores and those of other Mediterranean countries. Similarly several local officials in Italy have condemned the hardline stance, such as the mayor of Palermo, Leoluca Orlando and the Mayor of Naples, Luigi de Magistris, the latter stating that “…the port of Naples is ready to welcome” the migrants. “We are humans, with a great heart. Naples is ready, without money, to save human lives” he tweeted on June 10. A breakthrough in the situation occurred only when Spain’s newly elected Prime Minister, Pedro Sánchez, decided to welcome the 629 migrants after the mayors of Valencia and Barcelona both offered to take the boat in at their ports. “It is our duty to help avoid a humanitarian catastrophe and offer a safe port to these people” Sánchez’s office said. 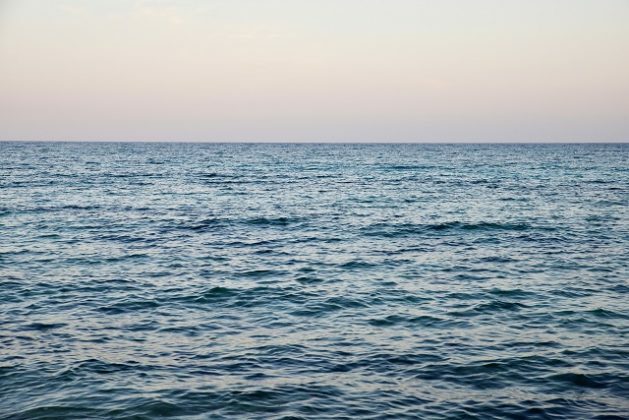 As of 15 June, 792 migrants have either died or gone missing while crossing the Mediterranean, says the UN Migration Agency (IOM). This number represents a decrease compared to the last three years, as deaths in the same period, were 1,836 in 2017, 2,899 in 2016 and 1,806 in 2015. However, this situation is still represents a shameful paradox in our century. In 2017, migrants dead or missing while crossing the Mediterranean waters were 3,116 and the EU initiatives and allocations of funds have not been able to avoid these tragedies. 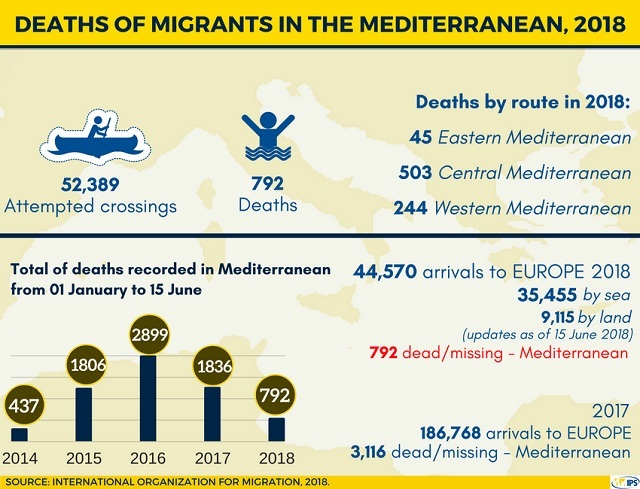 In 2018 alone, of the 52,389 people who attempted to cross the Mediterraneam rim, 792 died, making the death rate 1.5%. The deadliest route in 2018 is – as of June 15 – the central route (503 deaths), as opposed to going by the western route (244) or the east (45). The timing of the Aquarius’ events may not be completely coincidental, as there is an EU meeting at the end of June that will consider changing the rule that asylum must be claimed in the country of first entry. That is the rule that has put Italy on the frontline of Europe’s migration crisis. If considered in this light, the latest Italian decision, could be viewed as a bid for a domestic political win, as dissatisfaction of Italian public opinion towards migration flows has been steadily increasing in recent years. It remains to be seen what will be the political outome at the EU level. After being abandoned for four days, those migrants feared they were going back to Libya, a nightmare that obviously any of them wanted to consider. On November 2017, a CNN report on slave auctions in Libya had prompted international outrage over a slave market operating in the country. Ben Fishman, an analyst from The Washington Institute, has highlighted what are the root causes of the growth of this general abuse of African migrants in Libya. “First” he wrote in a policy paper right after the CNN report was published, “many traffickers exploit migrants’ desperation to reach Europe, often trapping them in Libya. These traffickers enjoy free rein in Libya exploiting the country’s lawlessness in the same manner that the Islamic State did in 2015-2016 when it took control of Sirte. Smugglers and gangs overlap with the militia landscape, making it extremely difficult to curtail the activities of one group without impacting the overall profit stream”. Fishman also added that “the main push factors that compel migrants to risk these treacherous journeys – namely, poverty, and lack of opportunities […] have not been adequately addressed”. In 2015 the EU had established a 3.2 billion euros fund to facilitate migration management at the point of origin in Africa but this EU-led initiative clearly needs to be greatly expanded. Many analysts and activists urge the EU to address the migration crisis in an adequate and sustainable manner. Migration flows will continue, especially if policy responses remain as weak as they are at the moment. The EU needs to implement a comprehensive framework that deals both with the situation in Libya and with the points of origins in Africa, as well as with the welcoming policies implemented by the receiving countries in Europe.